My grandma had 11 kids…… ELEVEN! I have one busy little 2 year old. I am convinced my grandmother is the most saintly person on this earth. While raising all these great people, her and my grandpa had the typical farm, complete with hogs, chickens, cats, dogs and of course, cattle. In later years, every spring and fall us grandkids, would drive the cattle herd from cow camp to the home place or visa versa, which took about two days. These memories are some of my most treasured. My cousins and I played hooky from school and when the bus approached we thought we were the coolest cats on the prairie as we led the bus through the cattle on our horses, waving at the kids that had to attend school that day. The second best thing about long days helping grandpa with cows, was my grandma’s sandwiches. She would come with bread sacks full of them. Most were bologna, slathered with some white stuff and if she felt fancy, some cheese. They were the best sandwiches I had ever tasted. Now thinking back, it was probably just because we were so hungry. About a year ago I finally figured out her secret of Miracle Whip instead of mayonnaise. Who knew!? This brings me to my topic of ranch wives. I am very early in my experience of being a ranch wife/mother, so I am constantly observing other gals that share the same lifestyle. I have concluded that ranch wives are a very special breed of women, like my grandmother, that have amazing skill sets that make newcomers like me, a little intimidated. They can cook, mend, clean, take care of the babes and husband, keep the place tidy, like a traditional wife. PLUS they chop wood, fix fence, memorize spring and fall vaccine protocols, ride, rope, hammer nails, castrate calves, drive truck—the list goes on. Sometimes they do all this and even hold down a full time job in town! Growing up in agriculture definitely gives you a leg up, but I am sure finding a young gal that has mastered all those tasks doesn’t come around every day. If you find one, I’d recommend marrying her, quick! See, I learned more about the outside chores from my mother than I did inside, which I am grateful for, but cooking did not come as naturally to me as some girls. I can burn dinner as good as anyone. Early on, I was more likely to kick in the oven door by the time all was said and done. Now I find myself mulling around in the kitchen trying new recipes any chance I get. Although I would rather be outside (as I’m sure most of us would) doing all the activities that create calluses or riding our ponies around, housework has grown on me. Not that any of us particularly care to do dishes or laundry, but there is an element of satisfaction knowing you have a clean house for your family to call home. Of course this balancing act is not narrowed to country folk; it’s any new wife or mother. We all share these times of trial and error, rancher or not. 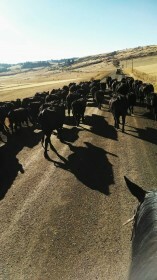 Moving the cows back out to pasture after weaning. Our daughter Mesa, keeps my husband and I on our toes. We are in the process of fine tuning our negotiation and bribing skills. No matter the degree of meltdown, when we ask if she wants to see the baby calves, she always responds with a sniffle and a “yeah!” It warms my heart to see her enthusiasm towards an industry I am so passionate about. I hope she never loses it. I am a lucky gal to have had some strong female influences growing up and now Mesa has them as examples as well. 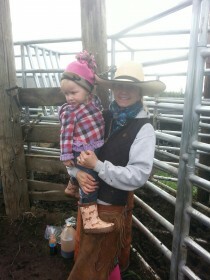 You can bet that I will do my best to teach her the qualities of a ranch woman. Goodness knows we need more of them! Sometimes when I have planned ahead and have a meal ready for all of us after we come in from working cattle and I didn’t even mess up drastically, I feel like I am getting closer to being one of the many ranch wives I idolize. Ranch wives are tough and caring, bold and compassionate, full of grit and pride. They know when to stand their ground and when a caring touch is needed. There is no better group of women and I am fortunate to have them as family, friends and neighbors. I look up to these talented women and maybe someday I can earn a place among this bunch of cowgirls. 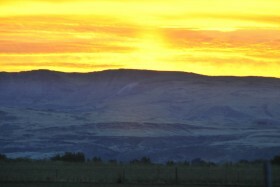 Diana and her husband grew up farming and ranching. Now they own a crop and rangeland spraying business, and their own herd of cattle. Diana is a busy ranch wife and mom to a two-year-old little girl. 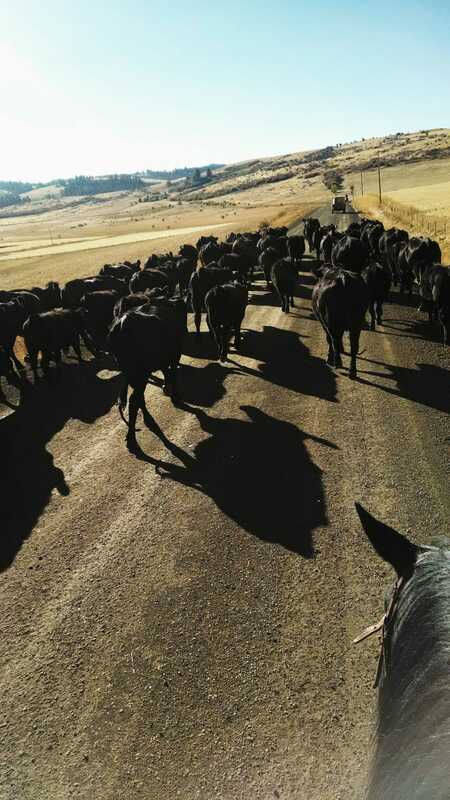 When not helping with their spraying or cattle, she travels throughout north Idaho discussing feed programs with ranchers as a full-time feed consultant. I couldn’t get anything done this morning. . .the kid’s breakfast was put on hold, lunch ingredients stayed on the counter, coffee cooled. This sunrise made me stop in my tracks as I silently watched the sky explode in colors and dimensions. The cows started their morning movements of grazing, finding calves, moving from their bed ground. The fall ground fog hinted at much needed moisture seeping into the ground. It was spectacular. So, why is this “blog worthy”? Because it reminded me that much of this life remains out of my control. I worried fitfully in my sleep of cows coming in from the desert thinner than expected as a result of a dry summer. I felt my mind not turning off, but thinking through the night of things that needed “fixed”. I find that much of the time in this livestock business, one continually finds things to be “fixed”; some are individual, some are regional, some are international, some are intentional, some are perceptional. 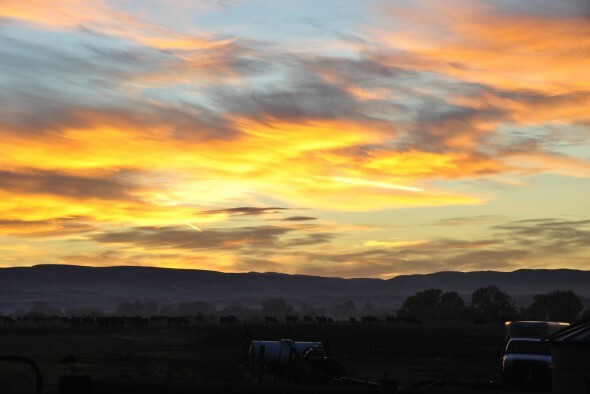 Julie and her family own a cow-calf, yearling operation and custom feedlot in southwest Idaho. 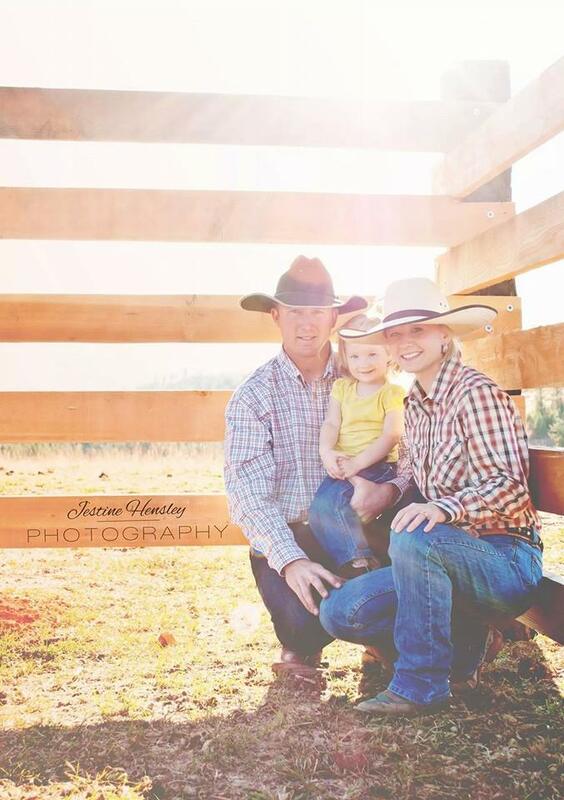 She and her husband were raised on livestock ranches and their industry roots run deep. 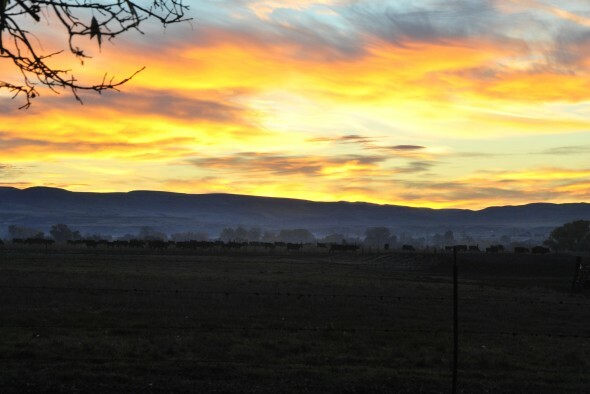 Their children have been very active and involved in the ranch and feedlot, and are developing their own herds of quality cattle.